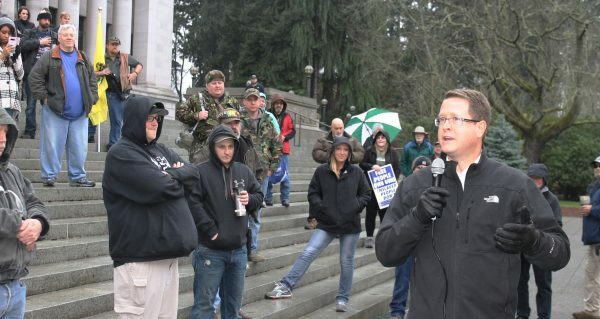 Last Friday, Republican State Rep. Matt Shea from the Spokane area spoke to activists on the Capitol steps. He said the state should have a gun “behind every blade of grass,” according to the Spokane Spokesman-Review. Shea is among the state’s most stalwart rights defenders, and he reportedly blasted the “tyranny” now at work in the Evergreen State that is eroding the Second Amendment rights of an estimated 2 million Washington gun owners. More than 608,000 are licensed to carry concealed, and during an impromptu conversation Monday with a delegation from WaGuns.org at a shooting range outside of Las Vegas, there was a serious discussion about energizing those armed citizens into activism. What is happening in Washington appears to be fulfilling a prophesy that rights activists have been warning about for decades: The dismantling of Second Amendment and state constitutional protections for guns and the citizens who own them. For years, those concerns have been dismissed as “gun nut paranoia,” but one look at what has happened in Washington over the past four years, and in California, New Jersey, New York, Maryland, Massachusetts, Connecticut and a handful of other states over the past generation belies the sneering cynicism. With a state attorney general and Democrat majority in Washington State advocating exactly the kinds of things rights activists have been warning about, Second Amendment advocates gathered here agree that the warnings were not fantasy but fact.